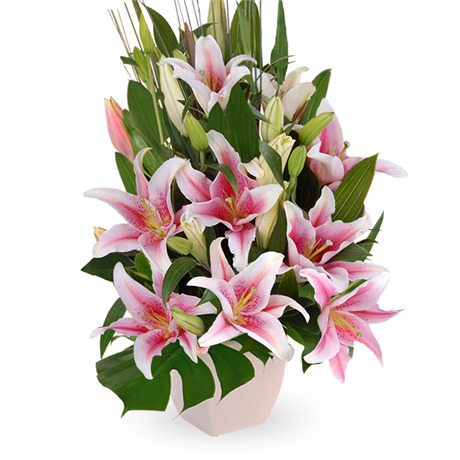 Astound someone special with this incredible reverie of intense pink Oriental lilies, creatively arranged in a ceramic pot. The Zara is a spectacular gift that heralds its presence with an intoxicating fragrance before you lay eyes on it. With such lavish pink petals, you have to see this for yourself to witness the nature of beauty at its finest. A true floral masterpiece, this awe inspiring arrangement is perfect for a corporate function, as an extravagant romantic gift or as thoughtful birthday gesture. If you’d like to go all out, we recommend pairing the Zara with a box of delectable chocolates, or perhaps a bottle of celebratory champagne.